Drawn capotte of white crape, ornamented with blonde and a bunch of marabouts consisting of seven feathers, placed in a drooping position low at the side. The bonnet, it will be perceived, sits very much off the face, but descends low at the sides, one being rounded, the other left pointed. 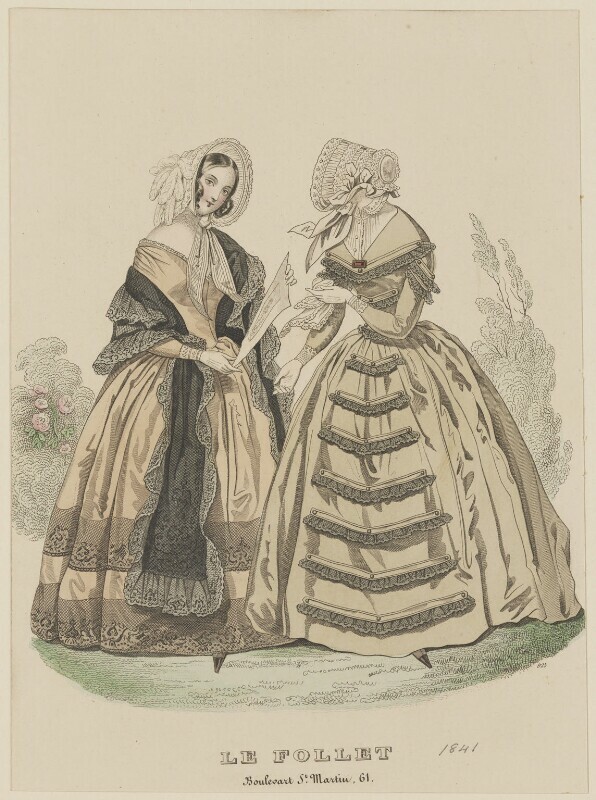 The dress is of nankeen colour poux de soie, the corsage à pointe, but rounded off and plain with the exception of a few gathers at the front of the shoulder, it has one seam down the centre of the front, the back where it fastens is tight, and it is sloped off at the bosom en coeur. The skirt is ornamented with two rows of very deep black lace, put on as flounces, but without the slightest fulness whatsoever. Black lace scarf lined with black Florence, and trimmed all round with black lace. Hair in one large ringlet at each side, the bosom of the dress trimmed with a very narrow lace, embroidered cuffs, while gloves, puce colour brodequins. 2nd figure. Drawn capotte of mauve colour poux de soie, shot with white, this bonnet is hardly transparent, the spaces between each drawing, being white lace, the front is also edged with the same, and a fall put on with fulness goes round the top of the crown. The bows of ribbon are placed very low at the left side. Dress of drab colour taffetas d'ltalie. Corsage three quarters high and quite tight, fastening at back. Sleeves plain and tight, but with only one seam. The front of the skirt of the dress is ornamented en tablier with falls of black lace put on. To the lower side of narrow bands of the material of the dress, edged all round with a satin liseré or piping, increasing gradually in length as they go down and fastened on to the dress with jet buttons. Our readers will comprehend our meaning better by a simple glance at the plate than by the most elaborate description we could give of this trimming. The habit shirt is of a new pattern called the col chevalière. The front of the shirt has a few gathers, and the collar, a half standing one, like that of a boy's shirt, with the corners rounded, is embroidered, and trimmed with a very narrow Valenciennes which is continued down the front. It is fastened with three buttons or studs. Guipure cuffs, white kid gloves, cambric handkerchief, puce colour half boots.